Logic offers integration of our shipping solutions to a number of leading business and accounting packages including QuickBooks, Peachtree, and JD Edwards. Recently, we have added a set of adapters to our product line, making it easy for your business to integrate our shipping solutions with the Microsoft Dynamics Suite or SAP Business One. The Microsoft Dynamics Suite is a line of familiar, adaptable enterprise resource planning (ERP) and customer relationship management (CRM) solutions designed to meet almost any business need. Microsoft Dynamics works like and with familiar Microsoft software—easing adoption and reducing the risks in implementing a new solution. These solutions automate and simplify financial, customer relationship, and supply chain processes in a way that can help drive business success. 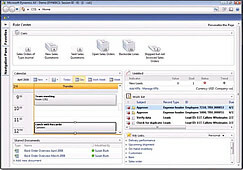 Logic's Microsoft Dynamics adapter, powered by Northern Micro, leverages the .NetBusiness Connector for seamless integration. This flexible and comprehensive adapter for Logic's shipping solutions enables shipping for UPS, FedEx, DHL, USPS & LTLs from within the Microsoft Dynamics Suite interface. Once shipments are completed, shipping charges and tracking information are returned to the software's tables. SAP Business One, designed specifically for small businesses, integrates all core business functions across an entire company including financials, sales, customer relationship management, e-commerce, inventory, and operations. 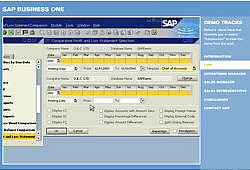 Unlike many other small business solutions on the market today, SAP Business One is a single application, eliminating the need for separate installations and complex integration of multiple modules. Like Logic's Microsoft Dynamics adapter, our SAP Business One adapter seamlessly integrates our shipping solutions with SAP Business One. By streamlining the business management and shipping processes, Logic Systems can help you run your business more efficiently.